EDDD 24: Look, A Little Tiny Grinch! 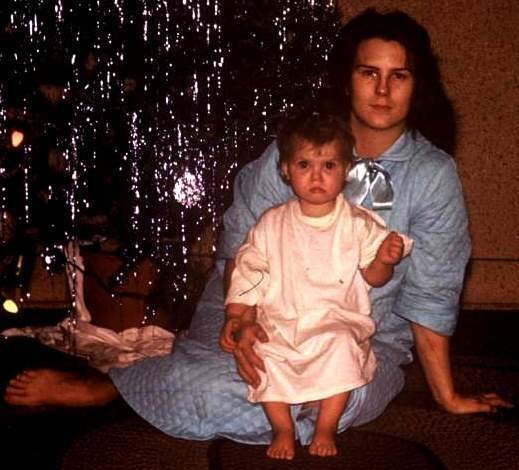 Seems to be a trend I started early…Not so excited about the holidays, but love this photo of my beautiful mom:>) Just because I’m a Grinch, doesn’t mean that I don’t wish each of you a wonderful holiday season! Categories: Challenges Prompts Contests | Tags: Christmas, family | Permalink. I don’t for one minute believe you’re the Grinch now. Have a fantastic Christmas and a Wonderful New Year. All those we’ve lost will be sharing it with us. hehehe, not so much a Grinch, just ho-hum. Love this picture of my Aunt Rae and Cousin Patti. Christmas Hugs to you Patti. Neither you or your mom look all that enthusiastic, Patti. Great photo. Quiet morning. In the afternoon, I stopped for hugs from old friends, but didn’t stay long enough to take off my boots. Then ninety minutes with the Mother-In-Law who was unusually pleasant and even a little grateful. Then I went to Taughannock Falls Park and photographed the falls and Cayuga Lake and made it home in time for a spectacular 15 minute sunset. My comment is longer than your post. Whose doing what for how many days, every damn day? No, we don’t. Mom has either a secret smile or a forced tiny smile. I’ll ask. She has a great memory at 74. Thank you for holding up my post with a warm post about your wandering, beautiful day. I missed a day–oops. Can’t really Make up for it, since it is over, but will do my best to get back on track. Hugs. No more “stink-stank-stunk” … Merry Christmas! Thank you, Debby. Yes, it was fun. I even edited them, so they were easier to see. Hugs and glad you got your power so soon. Paul and I once had a week with no power in winter, from flooding. We were high and dry and had a good generator!